B Main Sculptors are here to help make your decisions easier with a caring, attentive service that always considers your personal feelings. At B Main Sculptors, we understand that choosing a befitting and appropriate memorial for your loved one isn’t always simple. We’re here to help make your decisions easier with a caring, attentive service that always considers your personal feelings. Our monumental masons in Lanarkshire adapt carefully to the sensitive nature of our work. We know that you’ll always want your memorials to be dignified and respectful. To ensure everything stays in keeping with what you have in mind, B Main Sculptors draw on their many years of experience to recommend the right products, designs and even the choice of words. From there, our monumental sculptors in Hamilton go to work to bring your ideas to fruition. B Main Sculptors are National Association of Memorial Masons (NAMM) members. We’re Lanarkshire’s leading choice for headstones in Glasgow and all surrounding areas. Call in to see us at our premises in Cambuslang today where we have more than 100 different headstones on display. If you can’t find what you’re looking for, we’ll plan and design one for you instead. 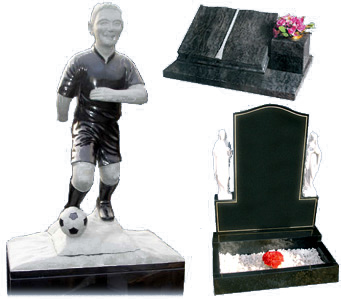 We have the products and the experience to bring your memorial ideas to life and set them in stone forever. We personalise headstones and memorial plaques in Glasgow in your choice of words and lettering so that your final farewells and thoughts are never forgotten. At B Main Sculptors, we help with the supply of flower vase holders, headstone erections and all other related services.